The first thing to say is that my WiFi dropout issue is not necessarily your WiFi dropout issue. In my 2 years trying to solve this issue, this is the biggest lesson I have learned. There are millions of people with WiFi issues and the term "WiFi dropout" is used to describe a lot of them. If you do not use Hyper-V, then this is not your solution. I have written about my specific issue previously here. I even claimed that I "solved" the issue. But I am not sure I did. I am very reluctant to name my laptop and specific WiFi card as I do not believe it to be related to the issue. Although you can find this out by looking at the previous post above. Every single day, multiple times per day, my WiFi would start dropping packets. 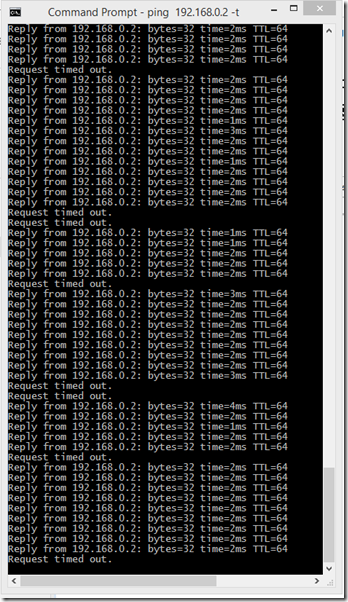 The issue is best shown by a screenshot of a continuous ping from my laptop to my router. Most people probably wouldn't notice this issue in everyday internet browsing as modern browsers are so resilient that they can smooth these types of connection issues out. There would still be a delay, but it would be very rare to get an error page. I noticed the issue first during Skype calls. The call would hang for a few seconds and then recover. The issue manifested itself across Windows 8, 8.1 and 10. With every new Windows version came new hope that the issue would be fixed. It never happened. What resolutions have I tried? The only solution that has reliably worked is disabling the Hyper-V External Network. If you do not use Hyper-V, then it is likely your issue is not the same as mine. In order to get my virtual machines onto the internet, I now use Internet Connection Sharing (ICS) and this is working perfectly. Internet Connection Sharing (ICS) setup between my WiFi adapter and the Hyper-V internal switch. And I no longer have any issues! !